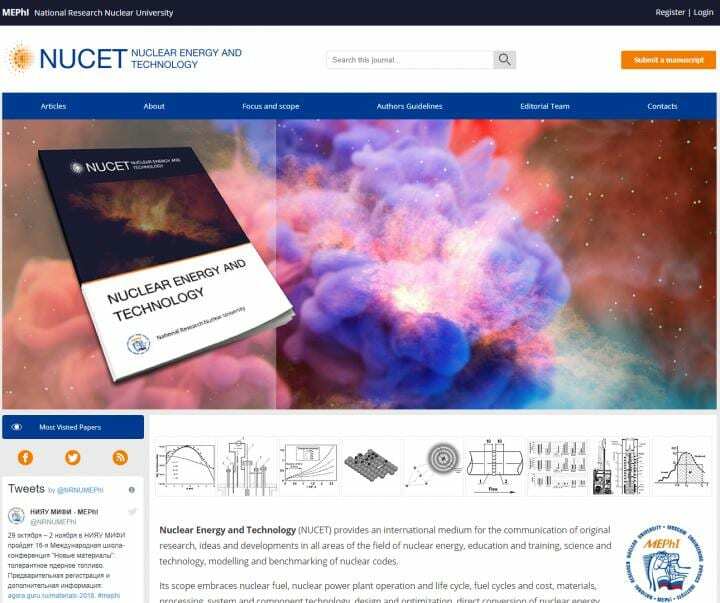 The first journal issue since the transition is now live on NUCET's new website and features a total of 12 research articles, covering topics including nuclear power plant operation, reactor physics and thermal hydraulics. – Nuclear policy, economics and education issues. Beyond the sleek new website, ARPHA platform provides various high-tech perks to ensure that the entire publishing process – beginning with manuscript submission and continuing all the way to the dissemination, archiving and indexing of the article's content and metadata – takes place within its single online environment. "I'm delighted to welcome NUCET to the growing portfolio of scholarly journals published on ARPHA," says ARPHA's and Pensoft's founder and CEO Prof. Lyubomir Penev. "As the first nuclear science journal joining ARPHA, I believe that NUCET could easily be regarded as a harbinger of a promising new area of collaboration and enterprise." "Today we are celebrating an important event – the first issue of the journal Nuclear Energy and Technology on the ARPHA platform." As the Rector of the National Research Nuclear University MEPhI and NUCET's Editor-in-Chief Prof. Mikhail Strikhanov says: "NUCET is an English-language periodical of the MEPhI that is promoting the results of our research to the worldwide scientific community". He also explains that the choice of platform was not accidental: "We have analyzed many publishing platforms and explored their strengths and weaknesses. ARPHA publishes many high-quality journals, and it is very important for us to be the first in the field of nuclear physics there. We are looking forward to continuing cooperation with Pensoft, and we are confident that with the help of ARPHA NUCET has an incredible future and the quality of its materials will be at a high level". It empowers the world's best nuclear technological experts and talented students to produce secure and stable energy, excel in creating applicable science, boost human capital and economic output in various fields, support industry and business and be innovative and creative. ARPHA is the first end-to-end, narrative- and data-integrated publishing solution that supports the full life cycle of a manuscript, from authoring to reviewing, publishing and dissemination. ARPHA provides accomplished and streamlined production workflows that can be customised according to the journal's needs. The platform enables a variety of publishing models through a number of options for branding, production and revenue models to choose from. Pensoft is an independent academic publishing company, well-known worldwide for its innovations in the field of semantic publishing, as well as for its cutting-edge publishing tools and workflows. In 2013, Pensoft launched the first ever end-to-end XML-based authoring, reviewing and publishing workflow, as demonstrated by the Pensoft Writing Tool (PWT) and the Biodiversity Data Journal (BDJ), now upgraded to the ARPHA Publishing Platform. Flagship titles include: Research Ideas and Outcomes (RIO), One Ecosystem, ZooKeys, Biodiversity Data Journal, PhytoKeys, MycoKeys and many more.